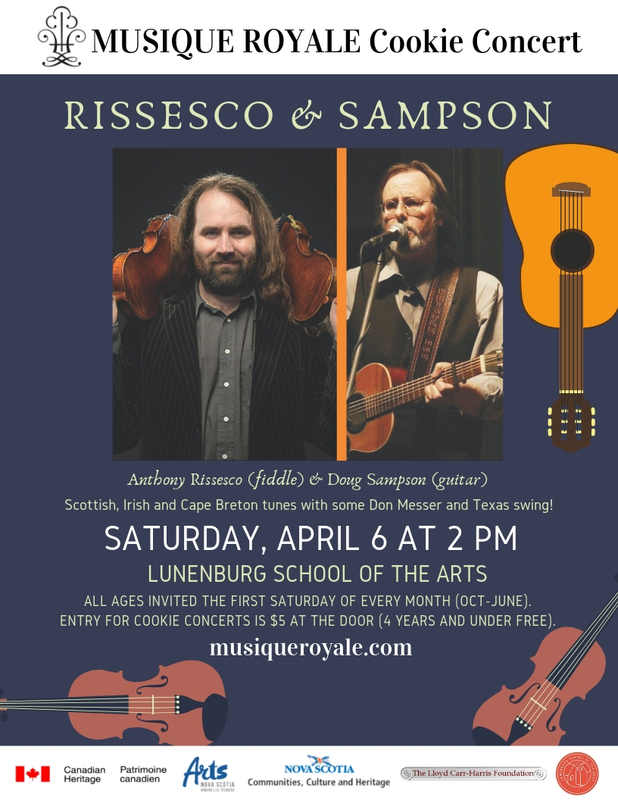 Musique Royale is delighted to present the unstoppable fiddling of Anthony Rissesco and grooving guitar rhythms of Doug Sampson for the April Cookie Concert. The duo will bring a range of Scottish, Irish and Cape Breton tunes. Sit back and relax to this energizing music, even including some Don Messer and texas swing, (and hear the boys sing a song or two as well)! Anthony Rissesco is a contemporary violinist who performs folk, fiddle, rock, classical and more. He was a student of Jan Wicha and Philippe Djokic. He has toured for many years with Lennie Gallant and appeared on Lennie’s album “Live Acoustic at the Carleton” which received a Canadian Folk Music award. Anthony has been on many festival stages across the U.S with roots rock band “Pogey”. He has played and toured with many artists from the Maritimes including Bruce Guthro and Anne Murray. He has been a guest performer with Symphony Nova Scotia several times either performing with Lennie Gallant or playing fiddle medleys and singing folk songs. He is part of the trio “Papilio” which has released its second CD and whose first was nominated for an ECMA and Music Nova Scotia awards. He grew up playing in the “down east old time tradition”and competed in fiddling competitions across the country. He is a first place prize winner in five Canadian provinces and has represented Nova Scotia at the Canadian Grand Masters several times. Anthony is 3rd prize winner at the Canadian open. He is also a past Maritime fiddle champion and recently a judge at that oldest of Canadian fiddle competitions. Guitarist Doug Sampson has spent more than 40 years on the local entertainment circuit in Nova Scotia and is well known for his expertise with Celtic styles, perhaps most especially for with his work with fiddler Anthony Rissesco. In the 90’s he toured with Brakin’ Tradition and shared the stage with The Rankin Family, The Barra MacNeils, Rawlins Cross, The Irish Descendants and many others. Doug’s work has by no means been limited to the club scene in Nova Scotia however, on the international stage he has opened for stars such as Kenny Rogers, Mel Tillis, John Prine, Loudon Wainwright and Taj Mahal. Cookie Concerts are hour long presentations incorporating music with other artistic creativity, for the whole family to enjoy! 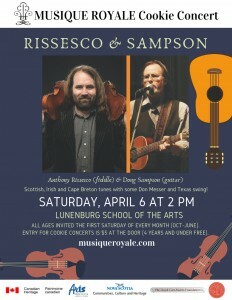 Come out the first Saturday of each month from October-June, always 2 pm at the Lunenburg School of the Arts. Musique Royale is a prolific, province-wide presenter of music in Nova Scotia. Since its founding in 1985, this non-for-profit has brought world class music to venues of architectural and historic significance across the province. Presenting Symphony Orchestras and Chorus’ in beautiful churches to salon-style events, and children-friendly shows encompassing jazz, world, classical, and more. Whatever your appetite for music is, Musique Royale has something for everyone! Musique Royale gratefully acknowledges the Federal Department of Canadian Heritage, the Nova Scotia Department of Communities, Culture and Heritage, Arts Nova Scotia, the Lunenburg School of the Arts, Peggy Corkum – major season benefactor, the Lloyd Carr Harris Foundation, the Craig Foundation, anonymous contributors, corporate and individual sponsors, committed volunteers and all patrons for their kind and generous support of Musique Royale.